Good time of day, ladies and gentlemen! We’d like to welcome you aboard Flight #1 heading to Your Dream Job. The flight deck wishes you a pleasant read, and we thank you for flying with Zety Airlines. Traveling to distant shores. Soaring above the clouds. White-knuckle turbulence like the greatest roller coasters at Six Flags. But hang on a minute. Being a flight attendant sounds like everyone’s dream job. Hell - even I want to fight you for the opportunity. There’s gonna be a lot of competition. How can we make your flight attendant resume stand out to land you that interview? We’re about to take off. So fasten your seatbelts. We’ll fly through this together, step by step. A flight attendant resume example better than 9 out of 10 other resumes. How to write a flight attendant resume that will land you more interviews. Tips and examples of how to put skills and achievements on a flight attendant resume. How to describe your experience on a resume for a flight attendant to get any job you want. 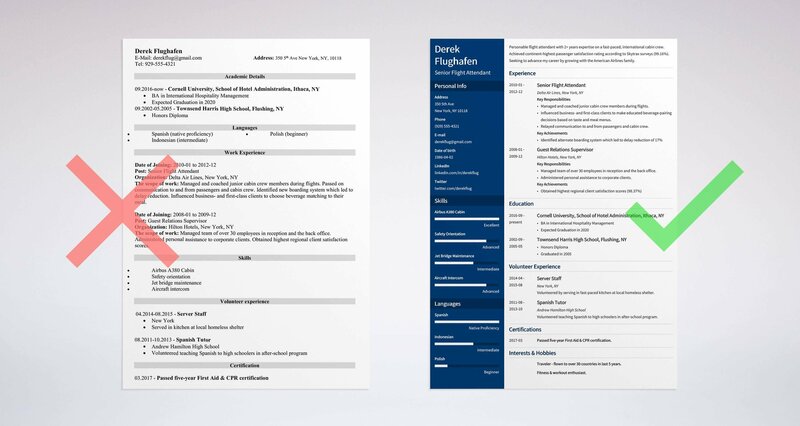 Here's a sample resume for a flight attendant made using our resume builder. What’s the Best Format for a Flight Attendant Resume? Most of the time, airline hiring managers won’t read your whole resume. It gets worse: they’ll take only 6 seconds to scan a resume. That’s 6 seconds to consider you for an interview. The only thing shorter than that is the amount of sleep you’ll get most nights as an F/A. You need to catch their attention. You need to do it quickly. And you to not let go. You need the right flight attendant resume format. Luckily, it’s not as difficult as it sounds. Depending on your past work history, there are two main ways to go about this. Been in a jump seat before? Splendiferous! You’ve got the AAdvantage. The reverse-chronological format is best for your experienced flight attendant resume. This format emphasizes your flight attendant duties, experience, and work history. But, how can you format a flight attendant resume without experience? You might not have experience for this job, but you have experience relevant to the job. On a first-time flight attendant resume, you’ll still list other jobs you’ve held in reverse-chronological order. However, this time you won’t just talk about your duties and responsibilities. Rather, you’ll highlight relevant skills and achievements from past jobs in bullet points, neatly aligned like the buttons on your crew uniform. Pick and choose these transferable skills to match the flight attendant job description from the ad. Have no work experience at all? Not to worry! Instead, the education section will move to the top, followed by other sections (e.g., volunteering, languages), which we’ll talk about more in just a moment. 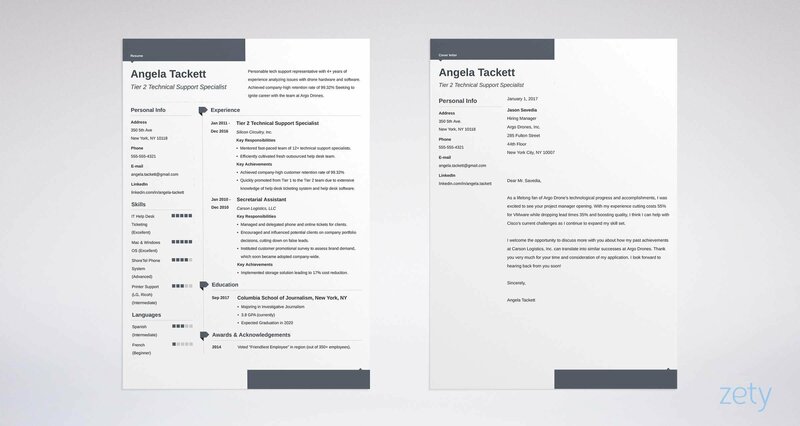 Next, save your great flight attendant resume template as a PDF. The PDF format keeps the layout in shape. Pro Tip: Check the job posting to make sure PDFs are OK. Some Applicant Tracking Systems (ATS) can experience engine trouble on a PDF-formatted resume. The ATS scans for keywords, and if it can’t read your file, it’ll assume you can’t do anything right. Flight Attendant Resume Summary or Resume Objective? You want to make an impression. You want something that’ll leave a pleasant aftertaste. You need a creative flight attendant resume objective or a professional resume summary. Don’t worry! We’ll go over the two now, and you’ll be able to pick the best one for your situation. You check seatbelts are fastened in your sleep, and you call out “doors to arrival, crosscheck, and all-call” before leaving your apartment each day. Do you have flight attendant experience? It highlights your related work history. Personable flight attendant with 2+ years expertise on a fast-paced, international cabin crew. Achieved continent-highest passenger satisfaction rating according to Skytrax surveys (99.16%). Seeking to advance my career by growing with the American Airlines family. I have been a flight attendant for the last 2 years. In addition to my knowledge of flight attendant duties, galley responsibilities, and safety procedures, I also carried out various ticketing duties (e.g., scanning tickets, boarding) during peak periods. Take the “Wrong” one: it’s great that you were able to handle the duties at both the counter as well as on the plane. However - and no offense - but who cares? You’re just listing your regular tasks as if they were accomplishments, which they aren’t. In the first example, we give evidence of our achievements and quantify our experience. Plus, quantifying your accomplishments is something employers crave for. The closest you’ve come to being a flight attendant is when you brought your dad coffee while he played Microsoft Flight Simulator. Don’t have any flight attendant experience? It briefly explains the career path change or new direction. I am a hotel supervisor without experience in the aviation industry, but many people say that I am a fast learner. I am highly motivated, love to fly, and turbulence doesn’t bother me that much. In the first cabin crew resume objective, we used some transferable skills from a position as a hotel supervisor in guest relations. The second career objective for air hostesses and hosts implies the same, but it doesn’t explain enough to hold the hiring manager’s eye. This won’t fly! American Airlines is taking a greater chance by hiring someone without experience. You’ll need to show them that you have what it takes. Pro Tip: Personalize your good flight attendant resume template by dropping the airline’s name into your resume summary or objective - this will make it great. You want to hear this from Air Traffic Control and when the hiring manager reads your perfect cabin crew resume. An excellent question, dear reader! You’re going to go far. To do that, we’ll underscore your experience in a way which wakes them up like takeoff acceleration by jet propulsion. Done this before? Years of experience? Great! You’ve got a running start. Still, pick those perfect flight attendant resume bullets that are most relevant. Matching the airline’s interests is in your best interest. Managed and coached junior cabin crew members during flights. Influenced business- and first-class clients to make educated beverage-pairing decisions based on taste and meal menus. Relayed communication to passengers and cabin crew and from the flight deck in a professional and personable manner. Assisted passengers and instructed on passenger safety. Delivered messages between pilots and cabin crew. See the differences? The “wrong” example seems okay, at first - we explained our duties and tasks. However, that’s just it: those were our responsibilities. In the “right” example, we itemized our duties with more detail, and then we included a proud achievement(s) for the win. Oh, and the same goes for entry-level flight attendant resumes, as well. You can’t tell a deadhead from a bulkhead. Never worked as a flight attendant before? Take it easy. You’re not a flight of fancy. So let’s show the head honcho that. Managed and coached a team of over 30 employees in reception and the back office. Identified key guests and administered personal assistance to corporate clients. See what we did here? At first, working in a hotel didn’t seem anything like a flight attendant, other than the travel aspect. But, we played up those duties and achievements which translated well onto a cabin crew resume with no working experience, particularly how great we are with guests. Pro Tip: Take some time to think about your past responsibilities. Which areas relate best to having strong flight crew skills? Pick those for your great flight attendant resume template. Is Your Education Section Underwhelming? It Might Be. An education section on their resume. While I imagine the first two are true, I do know that the education section is not just a valuable part of the perfect flight attendant resume - it’s almost always a necessity. You definitely need to put your education. So, how should we put your education on your resume for a flight attendant? If you have completed a degree, skip listing your high school on your flight attendant resume qualifications. Pro Tip: Stay consistent throughout your resume, and make sure you get things right. For example, it is Delta Air Lines (2 words), but United Airlines (1 word). I’m sure you’ll feel passengers thinking of you as such the next time a pen, peanuts, or a pillow are rudely requested. You and I know that’s a load of brainless stupidity (or BS, if I may coin an abbreviation). Here’s the deal: the hiring manager will probably have similar thoughts about all the corporate flight attendant resumes they’ll receive. They all look the same. They all smell the same. They all feel the same. How do we show them that yours isn’t the same? We need to play up your best flight attendant resume skills. 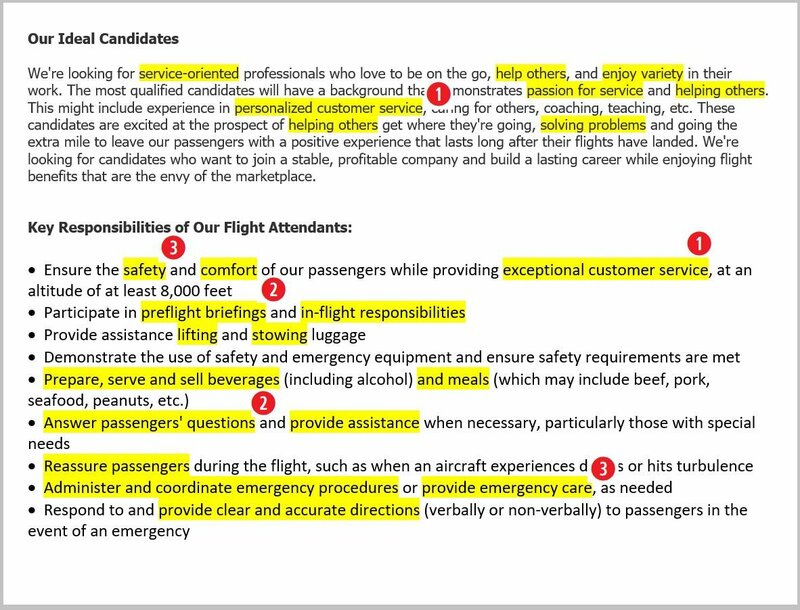 A skills section on your resume for flight attendants is essential, but only the right ones. Also, not too much and not too little. How do we add just the right amount? Let’s think of this like the meal service on a long-haul flight. But here, let’s serve economy class first by making a list of some generic hard and soft skills to put on a flight attendant resume. Hard skills are specific abilities and know-how (e.g., aircraft intercom). Soft skills are self-developed, life-learned attributes (e.g., safety consciousness, adaptability). Together, these are what makes a good flight attendant. Pro Tip: Try this: Type an oversized-luggage amount of your skills into an Excel column, with a number (1-10) of importance and flight crew relevance in the adjacent column. Then, remove from the worst up until you have the best 5 or 6 and can zipper it shut. However! These are great skills to have for the average flight attendant resume. The best flight attendant resume shouldn’t be, either. Those generic headphones you’ll pass out are fine, but only if the passenger forgets their own. To make your resume sound great, we can’t just list these generic terms. It’s time to offer meal service to the business class passengers - we’ll underline resume keywords that match the flight attendant hiring manager’s appetite. In the second one, your carelessness is evident - it looks as if you googled “flight attendant skills and knowledge” and shoved the results in there like a pissed-off baggage handler with nothing to lose. In the first one, you look like the answer to an ancient airline prophecy - just who the hiring manager has been searching for. We’ll include the perfect skills on your flight attendant resume, and we’ll vacuum up the unnecessary ones with the force of an airplane toilet flush. Pro Tip: Was it a good flight? Or was it a delightful departure? An agreeable arrival? An extraordinary exemplification of aerial navigation? Use action verbs and colorful words to make your resume more appealing to them. However, watch out for too much flourish or exaggerated descriptions - some recruiters may consider them inappropriate. Contact info, experience, education, objective, skills - check, check, check, check, and check. You’ve got the structural support of the flight attendant resume - the fuselage, if you will. Now it’s time to attach the wings and really let this resume fly. We’ll turn to our secret ingredient: extra resume sections. Extra resume sections make your resume more individual. Everyone since the Wright Brothers at Kitty Hawk puts their name, experience, etc. on their flight attendant resume. This is where you’ll list some relevant things that you’re proud of. It’s your chance to soar above the rest. Volunteer weekly at Rabid Rapid Rabbits (local animal shelter). Fanatical passion for gardening (I have 300+ herbs alone!). 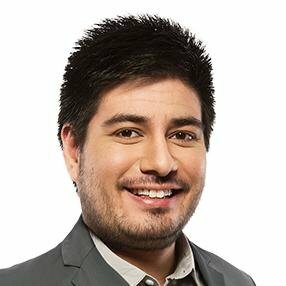 Voted “Most Likely to Succeed” in high school. You have every right to be proud of these points - anyone would be. However, they’re not relevant for flight attendant positions. I’ll go over some of the most popular additional sections for your flight attendant resume now, along with some better, more relevant examples. Know another language? That could be very helpful on a flight attendant resume, and maybe a necessity, depending on where you’re flying to. Knowing another language will expand your horizons and your flight attendant opportunities. And you’ll earn more! Spanish (Latin American) - Advanced Proficiency. Volunteered reconstructing damaged homes after the tsunami? You are a hero! Unfortunately, it isn’t so relevant for your flight attendant resume. Volunteered by serving in fast-paced kitchen at local homeless shelter. Volunteered teaching Spanish to high schoolers in after-school program. I invariably enjoy bar hopping on Fridays; perhaps you do, too. But you get the point, right? Not relevant! Years of experience as a traveler - 30+ countries in last 5 years. The travel is self-explanatory. The love of working out shows that you are physically fit - a plus for a demanding job such as being on the cabin crew. Passed five-year First Aid & CPR certification. Placed second in last year’s Brownie Bakeoff. Trained to handle emergency situations & certified to use various saftey equipment and emergency equipment. Gold Member - Eastern Flight and Aerospace Association (EFAA). Don’t turn in a resume with so much blank, white space. They’ll have enough of that blank, white space way up there at 30,000 feet. Relevant extra sections on your flight attendant resume are the answer. Pro Tip: Space is limited in the overhead bin - as it is on your resume. Don’t add too many extra sections on your flight attendant resume. Add only enough extra sections to fill the rest of the current resume page - not more that it spills over onto a new one. The captain has turned off the seat belt sign, so feel free to move about the cabin . . . Taking that seat belt off feels wonderful, like unbuckling your belt after Thanksgiving dinner. Working on the cover letter is similar, after coming from the limiting rules and suggestions of the resume. As a flight attendant, you’ll have a strict uniform and style standards - kinda like these past resume sections. The cabin crew resume cover letter is where you can let your hair down. But wait! Why do you even need a cover letter for airline jobs? Is it necessary? Now let’s craft a air host or air hostess cover letter before handing it all off to the hiring manager. Explain why the duties of a flight attendant excite you. Drop names - name the hiring manager and airline to personalize it. Inform them why they need you for this job. If you are flying economy class, you expect to be addressed as sir or ma’am. But we don’t want your resume to be economy class. Let’s make it first class. Better yet - a private jet. Call them by name in the cover letter. Mention something about the airline that you relate with. You dropped their name and caught their attention - now seal the deal with this next personalization. Positively grab their attention - it will mean more than degrees and certifications you list in your flight attendant resume. Pro Tip: Research the airline or the specific hub airport online and mention something in particular that stands out to you. This is something a resume can’t include and will really catch their eye! Did you know that our resume builder doubles as a cover letter builder, helping you to write a professional flight attendant cover letter? For more, read our cover letter tips or find out exactly what to include on a cover letter. If you want to get paid for being perpetually tired, your resume can’t be. The key to scoring that interview is through the perfect resume and cover letter. Using this flight plan for the ideal resume and flight attendant cover letter sample, you will have the key to unlocking many boarding gates of opportunity. Personalize, Personalize, Personalize. Address them by name in the cover letter. Mention the airline in the resume heading. Make it stick out like the bulbous hump on a Boeing 747. You want to join them, so make them need you. You are eager to become a flight attendant, so be all in. Employ action verbs and impressive achievements to let it take wing. Double- and triple-check. Spend an extra few minutes making sure that your flight attendant resume and cover letter are up to par. Did they ask to include a particular phrase in the email subject line? Are your email and cover letter addressed to the right person? Now. You should have a cabin crew resume & cover letter that’s ready for takeoff. Time to attach that final flight attendant cover letter and resume to an email and send it away. Fingers crossed! Do you have any questions on how to write a flight attendant resume? Not sure how to describe your skills and experience? Want more flight attendant resume tips? Give us a shout in the comments below, and we’ll answer your question.